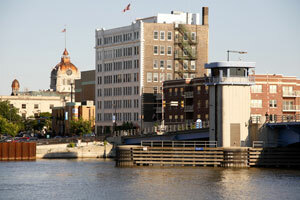 Green Bay is home to over 100,000 people making it the third largest city in the state of Wisconsin. There are many effective advertising opportunities throughout the city including colleges. Northeast Wisconsin Technical College and Rasmussen College offer the option to utilize out-of-home advertisements for cheap billboard rates. Target your audience with outdoor billboards or other outdoor advertisements near attractions like the Bay Beach Amusement Park and City Stadium. The major highways servicing the city also provide billboard possibilities. Billboards on I-43 or US 41 would generate high traffic exposure of your business. Zip Codes: 54301, 54302, 54303, 54304, 54305, 54306, 54307, 54308, 54311, 54313, 54324, 54344.